Impress us! You can create some pretty amazing games with WarioWare: D.I.Y., but can you create some pretty amazing Kotaku games? We're kicking off a contest today to see who can make the best Kotaku-themed WarioWare mini-game. Think of it is a Photoshop contest for budding game developers. Oh, and it's not just Internet fame on the line this time. We've got a pretty sweet prize package lined up too. The grand prize winner of our DIY contest will receive a Nintendo DSi XL system, one DigiPen Institute of Technology online class, a set of WarioWare games (WarioWare, Inc.: Mega Microgame$!, WarioWare: Twisted!, WarioWare: Touched! and WarioWare: Smooth Moves), one Nintendo World store gift card (worth $1,000 value), a WarioWare: D.I.Y. T-shirt package and a Nintendo Points Card for 2,000 points. 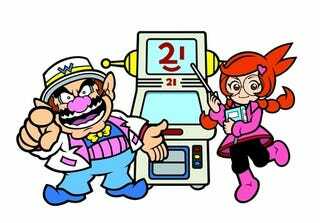 Ten runners-up will receive a WarioWare: D.I.Y. T-shirt package and a Nintendo Points Card worth 2,000 points each. We'll also randomly select ten valid entries to receive a WarioWare: D.I.Y. T-shirt package. Let's get this out of the way first, and don't blame us, this is a Nintendo of America requirement: You have to be a resident of one of the United States (excluding, without limitation, Puerto Rico and all other territories). You have to be at least 18. One entry per a person. Capture a video of your game creation and upload it on YouTube and then dump that video here in comments. Remember you can only enter the contest once. Do this by 12:01 a.m. April 19 Kotaku time. The mini-game has to include in it somewhere the word Kotaku. That's it. On Monday, April 19, we will create a poll for readers to vote on all of the entries. The 11 qualifying mini games with the most popular votes at 12:01 a.m. Monday, April 26, will be selected as finalists. The finalists will have to email me by Tuesday to exchange Nintendo DS Friend Codes with myself and other editors of Kotaku so that they can send us the mini-games to play. We will decide among ourselves which one of the eleven games is the winner and announce that winner on April 30. We will also announce the ten runner-up winners and the ten random winners selected randomly among those who entered valid games for the contest. One important programming note, if we haven't received at least 20 entries by April 19 we reserve the right to extend the contest.